This is an awesomely good way to eat zucchini, which the Brits call courgette. 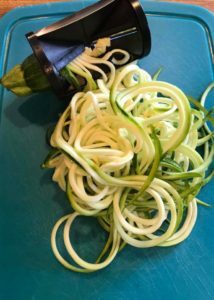 You spiralize and saute the squash, which then looks like spaghetti, hence courgetti. Some people call it zudles. Then add pesto to pan, stir and plate. How much you add depends on how much courgetti you have and how much you like pesto. 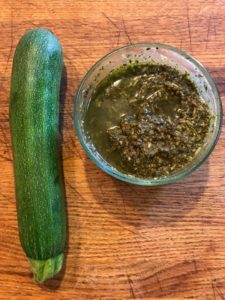 For me, one batch of pesto based on one bunch of basil will be enough for two medium size zucchini. 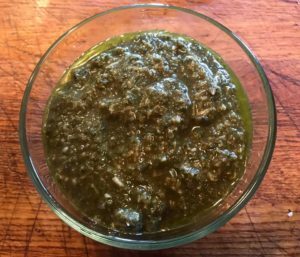 The batch in the picture below has more pesto than the batch in the picture with the egg. Just a matter of taste. If I am making this for myself, I would just use one zucchini and half (or less) of the pesto. 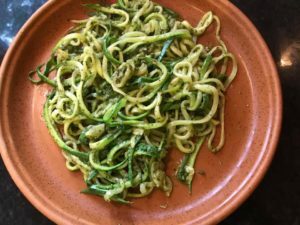 Plenty of other uses for leftover pesto, including more courgetti. This is a 10 minute meal from start to first bite. Really. I've timed myself. I do the pesto first (about 5 minutes) while putting on water to boil. 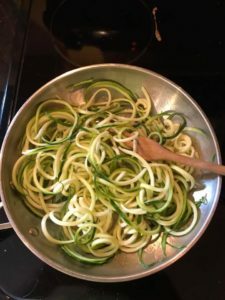 The spiralizing of the courgetti takes about a minute. 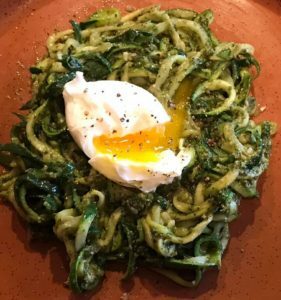 The poaching of the egg and the simultaneous sautéing of the courgetti takes about 4 minutes. So, 5+1+4=10. 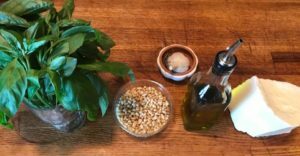 If you saute the pine nuts for a minute in a little olive oil before putting them in the food processor with the basil and the garlic, it punches up their flavor. That would add another minute, but who's counting? This is so good that I have stopped eating pasta, at least while the good local zucchini and fresh basil lasts.